I just posted an obit for Marian McPartland, who passed away last night at age 95. But my thoughts about Marian are more personal than her interesting bio and extensive resume or 34-year catalog of Piano Jazz segments. Marian was one of the reasons my father enjoyed jazz. And in turn, my father was (and still is) the primary reason I enjoy jazz today. He introduced me early on to Dixieland and swing recordings. And later he introduced me to his favorite pianists, Oscar Peterson and, most of all, Marian McPartland. 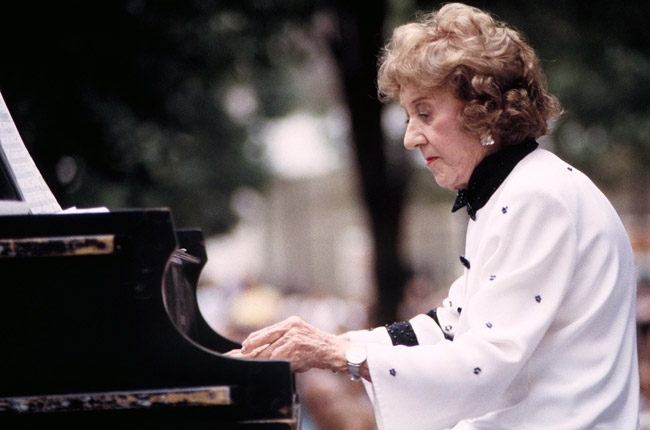 When I came back to jazz, having gone through a Keith Jarrett phase in the early 70s followed by a hiatus of classical, New Age and folk music, it was largely through Marian McPartland. When I turned 40 (let’s just say a couple decades ago), the CD was a relatively new medium and my parents gave me a “modern” system, complete with CD player. Of course I had no CDs yet. I remember my father and I headed out to Best Buy for some auxiliary equipment and ended up in the CD aisle, looking for the Jazz Section, which I’m sure was pretty limited. But there we found Marian McPartland’s Willow Creek and Other Ballads, which remains my favorite among her many sterling recordings. It’s solo piano, not her typical format (trio) and perhaps one of the more obscure among her Concord recordings of the past three decades. But it was an exquisite and pure introduction to McPartland, who could play anything with anyone (as proven by her interactions with her Piano Jazz guests) , but was most magnificent alone. One of Marian’s favorite quotes was an early declaration by fellow Brit, critic Leonard Feather, who wrote: “Oh, she’ll never make it: she’s English, white and a woman.” Now, one of my favorite quotes about Marian comes from the liner note to Willow Creek, where (30 years later) Leonard Feather notes, “She is an exceptionally lyrical ballad performer, enriching and expanding the harmonic and melodic essence of every theme.” Not a bad outcome for a white Englishwoman. Over the years I have accumulated more than 30 of Marian’s recordings (not counting her huge archive of Piano Jazz excerpts); I’ve also given a number of her CDs to my father to remind him of those nights in Chicago, probably at the 1960s edition of the Jazz Showcase. I had the fortune to see Marian perform live twice, about 12 years ago in Chicago at the Jazz Showcase and a couple years later at the Dakota in Minneapolis. I had planned a trip to Chicago around Marian’s appearance, not sure that I would ever have a better (or closer) opportunity. When she came out to greet the audience after her magnificent set, I told her that my father was a long-time fan (she smiled) and that I had come from Minneapolis to hear her perform. To which she replied, “I don’t believe you.” I guess she thought it was false flattery. It wasn’t. I did. And I wish I had been able to make that (or a similar) journey more often. Now, I’ll simply enjoy listening to Willow Creek and Other Ballads, and more, on my old fashioned CD player. If I ever get an I-Pod, this will be the first upload.